Social networking in India gets a regional flavour. It's perhaps an idea whose time has come. An entirely different world is gradually taking shape on social networks. You wake up to 'suprabhat' and end the day with 'shubhoratri'. Instead of 'weekend is here' messages on Friday, Goddess Lakshmi greets you with 'vanakkam'. Mondays aren't blue as memes adorned with hearts and roses ask you 'prem su che'. You don't post stories but 'premache status'. 'Shayari', 'mehandi' designs, 'chutkulla', romantic Bollywood songs, video clips of Indian daily soaps. Welcome to the universe of home-grown regional language social networks. Of late, several social media start-ups have emerged in the country that give users the opportunity to network in their preferred language. Take a pick: Hindi, Tamil, Telugu, Bengali, Marathi, Gujarati or even Bhojpuri. Platforms such as Sharechat, ClipApp, Roposo, Mooshak, Yourquote, Inpix from news app Inshorts, et al., are making it possible. India's social networking scene has been dominated by global giants Facebook and Twitter so far, but the emergence of Internet 2.0 in India is changing the landscape. Albeit slowly. The next 50 crore users are coming from beyond Tier-I, and they prefer their mother tongue over English. Hence, the 'desikaran' of Internet is in order and, as a result, social networking, too. According to a report by professional service company KPMG, India had over 23 crore language Internet users at the end of 2016. The number, it estimates, would surge to about 54 crore by 2021, while the English Internet user base would be just about 20 crore. In fact, Indian language users are expected to account for nearly 75 per cent of India's Internet base by 2021, says the report. Local language-enabled keyboards and smartphones have fuelled this trend over the past five years. Some 11 crore language Internet users access social media in India and this number is expected to swell to 30 crore by 2021, projects the KPMG report. 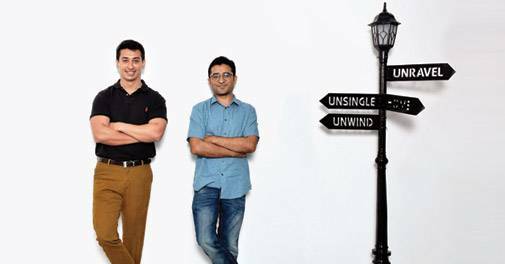 Farid Ahsan, Bhanu Pratap Singh and Ankush Sachdeva launched regional language social network ShareChat at a time when "It was uncool to build Indian products in non-English languages". 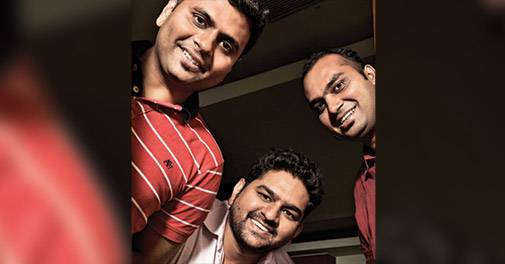 The trio stumbled on the idea for their start-up when one of them came across a post on Facebook about a WhatsApp Group on Sachin Tendulkar. "There were around 15,000 comments below that post. People were posting their phone numbers and this was something I had never seen before," recalls Sachdeva. The founders figured that the audience was looking for local content and reckoned that it might make a bigger impact if it was in a regional language. After multiple experiments and pivots, they finally launched Sharechat in October 2015. Today, the platform, available in 14 Indian languages, has most users from Tier-II and Tier-III cities. The most popular languages on the platform are Tamil, Telugu and Hindi and, interestingly, it's not available in English. "We observed that more than half the people speak English yet their engagement in the language was super low compared with Indian languages. So, we removed English," says Sachdeva. Similarly, Clip App, a social media platform for sharing videos, doesn't have the provision to share videos in English. Others, such as Mooshak and Shabda Nagari, offer the option to Interact only in Hindi. According to start-up analytics firm Tracxn, around 329 social networking companies were founded in India in 2015, 231 in 2016 and 45 in 2017. The space has seen an overall funding of $130.68 million so far, it estimates. The number of companies solely operating in the vernacular space is eight, but the figure could be higher as most of the Indian social media companies have either pivoted their models to operate in regional languages or have introduced more languages on their platform. Social media platforms in India can broadly be divided into three categories. The first is of global giants such as Facebook, Twitter, Instagram, etc., that have the maximum share of the market. The second includes platforms founded in the early years of this decade, such as Roposo and Tripoto, and have gained a certain foothold. Third is the new generation of networks such as Clip App, ShareChat, Inpix and VidStatus, founded recently and trying to address the content-language market. The new generation is also focussing on mobile and some of them are app-only. The Indian social networking start-up space doesn't have many success stories. Most ventures were founded in the past decade and many have already shut shop. The ones that have survived are also aiming to tap local language users now. Tripoto, a network for travellers launched in 2013, has raised the most funding among Indian social networking platforms, barring social commerce player Limeroad. It already has $32.72 million in its kitty and had a web traffic of 13.36 million in the April-June period, according to the New York-based analytics company SimilarWeb. The platform's success could be attributed to its focus on building a community around travel discovery. Tripoto, too, is betting on regional audience and content. "Some people are contributing in Hindi on our platform and that is the next phase of our growth," says Michael Pargal Lyngdoh, Co-founder of Tripoto. Roposo is another platform that has raised substantial funding. Initially, a social network for fashion enthusiasts, Roposo has pivoted its model now and takes content in eight other languages apart from English. Mayank Bhangadia, CEO and Co-founder of Roposo, says that in December 2017, when they introduced new languages on their platform, 80 per cent of their users had English as their preferred language. However, today 65 per cent of the audience on their platform has selected a language other than English. Just like ShareChat, Roposo, too, saw a rise in engagement on its platform when they introduced more languages. "Regional users spend 35-40 per cent more time as compared to an English user," informs Bhangadia. The popularity of these networks has grown drastically over last one year. 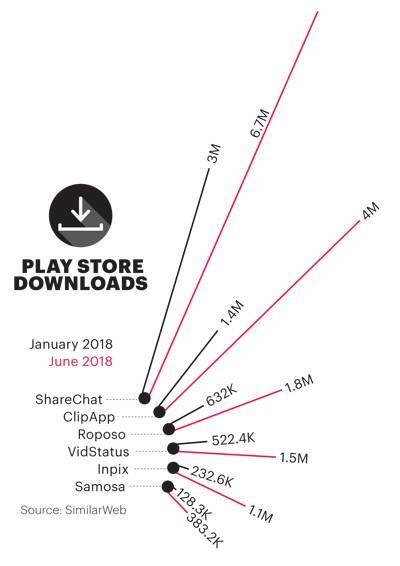 ShareChat has already raced ahead of global social networking giants such as Twitter, Snapchat, LinkedIn in top Android social app rankings in India and the top 15 social apps feature five language-based networks. A look at Google Play Store labels of regional language social networking apps reveals a similarity. All of them offer "videos, status, quotes, shayari". The users are not just attracted to networking but content in their language that can be shared with their own closed community on these apps and elsewhere. The rise of this trend could be traced back to language-based groups on WhatsApp, wherein users would look for content in their own language and share it across mediums. Some of desi social networks feature a "WhatsApp share" button below the posts on their platform, which makes it easier for users to share the content. The Indian Internet space hit another milestone in June 2018. A December 2017 report by Internet & Mobile Association of India and Kantar IMRB estimated that India would have 50 crore online users by June 2018. While this user base has the maximum share of socio-economic class (SEC) A and B English-speaking audience, it also has a significant share of socio-economic class C. The online business in the country so far has been hovering around the first two classes, but now the effort is on to tap SEC C, and, in addition, another 200 million will be coming online soon. However, the behaviour of this audience on the Internet is different from that of tech-savvy, English-speaking SEC A and B. "SEC C doesn't do much online shopping," says Sreedhar Prasad, Partner and Head, Consumer Markets and Internet Business, Advisory, KPMG India. "They may be heavily involved in Facebook and YouTube, but their next level of commerce link or activity online is not very high." Dev Khare, Managing Partner, Lightspeed India, shares an interesting anecdote. Reminiscing about his behaviour in the early days of Internet in the mid-90s, he says: "We forwarded jokes on our e-mails, chain letters and argued to each other that we would never put our credit card online because somebody would steal our money." According to experts, including Khare, India right now is witnessing a similar trend. The first-time Internet users in India watch, read, even create content and share it, but don't transact. The challenge is to have a thriving community and its put focus on generating content in regional languages. It has caught the imagination of investors and start-ups alike and given a ray of hope to social media start-ups in the country, which have been struggling for a while. For instance, IDG Ventures, an early investor in many e-commerce companies, has made investments in many content community platforms such as POPxo, LittleBlackBook, YourQuote and Tripoto. The venture capital firm is also looking at a lot of players in the vernacular market, focussed on non-English speaking users and users outside of the top 50 cities, informs Karan Mohla, Executive Director and Head of Consumer Media and Technology, IDG Ventures India. YourQuote, a mobile-only platform launched in 2016, offers its users the ability to write a text, turn it into text, picture or video and then share either on other platforms or to the community on the app. The start-up has 98,000 daily active users (DAUs) on its Android app, according to SimilarWeb, and claims to have a high-level of engagement. An average user spent about 19 minutes a day on their platform in June, estimates SimilarWeb. Other platforms such as Tripoto, Roposo, ShareChat and Clip App, too, focus on content creation by the audience. The motive is to keep users engaged and push for monetisation once the regional language ecosystem is ready. "If you capture a few 100 million new users and give them something that we wanted when we first came on the Internet, then we will have them engaged. And that is a very valuable asset to have. That is a distribution asset," says Khare, an investor in ShareChat. Rocketalk was one of the few social media start-ups introduced in India in the past decade. At a time, when Facebook was still trying to gain foothold and Orkut was 'the social media', Alan Coad, Rajiv Kumar and Bhartesh Chhibbar launched a social network for mobile phones. Initially, the platform saw huge traction in India and remains one of the highest funded social media start-ups. It had a huge user base of 20 million registered users when it shut down in 2014. Where did it fail then? The answer is monetisation. "We did not have any path to look at and forgot to think about monetisation," recalls Bhartesh Chibber, Co-founder of the app. Of the top 10 funded social media start-ups in the country, including social commerce, two have shut down, while one has pivoted its model. Chakpak Media, a networking site for South Indian movie enthusiasts is under liquidation, according to the Ministry of Corporate Affairs. The platform, launched in 2006 and later acquired by digital media and content services company Trivone Digital Services, perhaps was ahead of its time. L. Subramanyan, Founder of Trivone.com, didn't reply to Business Today's queries. Another start-up Touchtalent.com, a network for artists, has pivoted its model entirely and is now an Indic keyboard app Bobble Keyboard. According to the company, their first product did well initially but failed to sustain its momentum as the market was very small and they decided to explore something else. The takeaway is simple: You not only need to build a thriving community but also find ways to monetise it. Most of the social networking start-ups in India are concentrating on building a community, while some are still trying to figure out the monetisation part. And the ones making money have mostly gone the social-commerce way, instead of advertising. So, is social commerce the way ahead for these players? Advertisers, meanwhile, are still mulling the potential of these platforms. "They have made brands curious, but it is not the same as attracting attention," says Rajiv Dhingra, Founder and CEO, WATConsult. "While brands are showing interest in these platforms, they are not advertising on them as they are not sure whether this is a new audience they are capturing besides the ones on Facebook and Twitter," he adds. Ashish Bhasin, Chairman and CEO - South Asia, Dentsu Aegis Network, is more upbeat. "Advertising follows eyeballs. At the moment, it is a relatively recent trend and will take a while, but it is building up quite rapidly and I see this is definitely going to increase," he says. Besides monetisation, the challenge presented by social networking giants, is a cause of worry for these platforms. The global players have also introduced regional language on these platforms and they already have a huge user base. But experts say that the survival chances of start-ups are higher as global companies won't go deep into the audience and offer customised solutions. While Twitter, Facebook have introduced some Indian languages, they don't offer users features to connect in their own language. "Regional apps have a big USP which is that they can create communities in languages. And in the long run, it will be an app which provides access to lot of customised content for a particular community," says Ashish Pherwani, Partner and M&E Advisor Leader, EY India. While global giants can introduce such a feature tomorrow to capture this market, there is more than meets the eye. The traditional media in India is not limited to English or Hindi. Analysts predict a similar growth in social media. "We need very niche platforms which can be very regional-focussed. Even niche here is a good scale," says Neil Shah, Research Director, Counterpoint Research. "If you look at different demographics, they normally tend to be more open and sharing within their own linguistic group." The survival of these companies depends on matching the functionality of Facebook, Twitter, etc., and figuring out a concrete monetisation model.